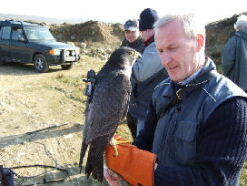 The Inishowen Raptor Study Group is a voluntary organisation made up of people from all walks of life with the common interest of studying birds of prey. 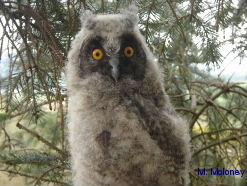 It is affiliated to the Irish raptor Study Group . 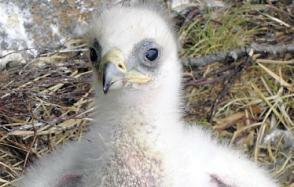 Members are also involved with the Golden Eagle reintroduction programme . As birds of prey are at the top of the food chain they are good indicators of the state of the local environment , in the past they have given warning of chemicals causing problems in the food chain when numbers declined . The group has monitored the recolonization of the area by buzzards , first recorded in1981,and now widespread in the county . 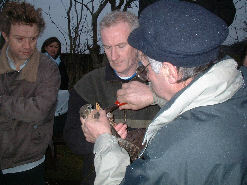 These large birds caused some apprehension among farmers and various groups , members met and discussed with local people explaining that buzzards did good by feeding on rabbits , pigeons , magpies , and rodents , redressing the balance of nature to some extent caused by the absence of large birds of prey in our environment . Other species surveyed are the Sparrow hawk , one nest having been monitored for 41 years , where broods of 5 and 6 have been regularly recorded . Merlin and kestrel sites are also monitored .Members participate in national surveys i.e. Hen Harrier , and in the 2002 Peregrine Falcon survey. The most difficult work yet undertaken is a population evaluation of Long Eared Owls , this nocturnal species appears to be increasing with the spread of conifer plantations in Inishowen . Eddie or Edwina ?........The new arrival at Glenveagh National Park. 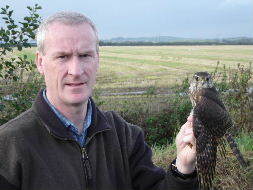 Martin moloney about to fly his Peregrine Falcon "Gina" for the B.B.C. program "The Return of the Raptors" shown in May , and will be screened again in the Autumn. 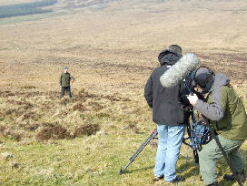 Martin checks camera on "Gina's back with camera crew in background during shoot.